We have the distinct “privilege” of living 1,000 feet from tower T3 of the Beaver Ridge Wind Project. Freedom residents on both sides of Beaver Ridge live almost as close but none as close as my family and me. We have tower T3 literally staring us right in the face winter and summer. In the summer the tower and blades almost disappear when you are by the house, but the tower and blades still hang above the house as you walk in our lower gardens. And, you can view the wind turbine from many other spots on our land. As disturbing as the visual presence of a nearly 400-foot wind turbine is, and its occasional hours of turbine-blade flicker, all that pales in comparison to the noise the turbines often produce. I would dare say we live in one of the noisiest neighborhoods in Waldo County. Let’s get one thing straight. I’m not claiming my life has been ruined. I’m not looking for sympathy. I’m sure many of you have suffered personal tragedies much worse than having a wind turbine built next to you. What I am asking for is the truth and some justice. I want to present you with a credible picture of the turbine’s effects on the quality of our family’s home life. I also want you to understand that the town of Freedom’s planning and permitting of the Beaver Ridge Wind Project was extremely flawed. It was marked by deceptions, poor planning, and small-town politics at its worst. In my opinion, the project has proven that many good folks in the town of Freedom were outwitted by CES now Beaver Ridge Wind. Many community members were so pro green they were susceptible to the developer’s deceptive practices and failed to be responsible to us and our neighbors. My challenge is to convince you that I am telling the truth. And that others, including my neighbors, the folks in Mars Hill and as far away as the Midwest, are also telling the truth about the disturbing noise created by these machines. Living next to a wind turbine is, to say the least, a very unpleasant experience. Good-meaning people write me and say; “We just don’t get it”. They tell me they have visited the Beaver Ridge turbines several times in different wind conditions, and it just doesn’t seem that bad. I also visited wind turbines. I visited them with the knowledge that one was going to be built very close to my house. I came away thinking living next to one was going to be somewhat annoying but that it probably was going to be OK. I was encouraged by the promises of Beaver Ridge Wind (then called CES). The very same promises that were never kept. What my neighbors and I have experienced has been much more negative than we had ever imagined. What is it really like living next to the turbines? There are “good days,” but there are way too many bad ones. Although the noise is almost always there, it is not constant in its intensity or type of sound. In minutes it can turn from an almost tolerable drone to a pulsating nightmare so oppressive that any outdoor activity is challenging. The noise also penetrates into the house. On many nights, as soon as you turn off the TV or stereo you immediately hear them. At least four to eight times a month they are very loud. The night noise can be especially disturbing. Some nights there is a loud pulsating noise that lasts right into the morning. On those days we get discouraged. We think that this can’t be good for our health and we might as well give up and sell out. The wind industry, often in concert with well-meaning government officials and environmental activists, uses all its power to diminish complaints and convince the general public that “wind farms” are quiet and that most folks don’t mind living next to them. When CES (now called Beaver Ridge Wind) came to Freedom, they assured us the turbines would be quiet. During the permitting process, they presented a study showing the noise level at our home would hardly ever be above 45 dBa. When all was said and done, the noise levels exceeded the promised levels (often twice as loud). When I asked Beaver Ridge Wind what they were going to do about the noise, they looked me right in the eyes and said they never really exactly promised us that. The developer’s clever promises and use of wind industry propaganda made it easy for the townspeople to support the project even though the setbacks in Freedom were among the weakest in the country. The setbacks were even below manufacturer’s suggested distances at property lines. It is my intent to show how the townspeople were misled. But for now, understand the developers presented a wind study they commissioned saying the sound levels at my house would rarely exceed 45 decibels. The truth is, sound levels are regularly over the promised level, and on many windy nights, can be twice as loud. Why was this not considered in our case? 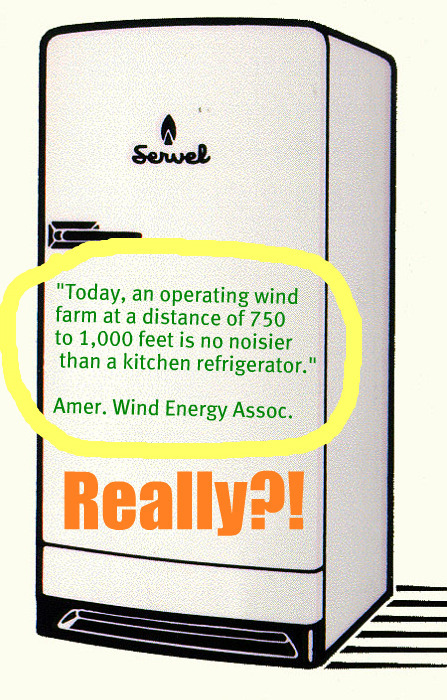 There is the classic wind-energy comparison of a turbine’s noise level to your refrigerator. First of all, at my house, the turbines are much louder and more annoying than my refrigerator. But let’s assume the turbines do sound like my refrigerator. I ask you to imagine your fridge is always running and that also, you have one on your deck, in your garden, by the compost, next to the garage, three or four inyour backyard, several well placed down your driveway, one at each door, one next to the grandkids’ swing set, and don’t forget the ones hanging outside your bedroom window. Get the idea? I think you might find even your fridge noise a little annoying. Then there are the possible negative health effects. Remember, the tower is almost 400-feet tall at the tip of the blades and we are 1,060 feet from the middle of the base. So at times, the tips of the blades are about 930 feet away. After a night of pulsating turbine noise that continues right into the morning, (no matter what studies prove) I feel as if this can’t be good for my family. I can only imagine what it would be like if one were predisposed to headaches, depression or a sleep disorder. Perhaps you are thinking, well someone has to suffer for the good of humanity, it might as well be the Bloomsteins. Maybe you are right, but does that give the developers and the wind-energy industry the right to lie about the impact? Beaver Ridge Wind and other projects in Maine are not municipal projects, these wind turbines are for profit. I might be less angry if they had said, OK your life is going to change and not in a good way. There will be a negative impact, you will be sacrificing the quiet rural life you once had for the good of the environment. But no, they don’t do that. They lie and tell your town you’ll barely hear them and it will be like being in a quiet room or a library. They could be honest and tell you that it will be noisy at your home. Beaver Ridge Wind could have mentioned the fact that other people have chosen to sell out rather than live close to a wind turbine. Instead they show videos and PowerPoint slideshows with misleading and deceptive statements. For us the damage is done. The turbines are up, and most likely, they are not coming down for a longtime. So the question for my family and me is: What do we do? We have lived and worked on our property for the past 34 years. Do we leave the house we built, the gardens we’ve planted, the place my children and their children love? Or, do we stay and learn to deal with the noise, worry about unknown health hazards, keep windows closed at night in the summer, sleep with earplugs on loud nights—whatever it takes to stay sane? We know our home will never be the same. If we do leave, what about the value of our house? The industry will tell you house values go up or stay the same, but there are many studies which show quite the opposite. No matter what we do our family now must fight for our rights. No one comes up to us and offers a solution. Oh, Beaver Ridge Wind might tell you they are working with us and in fact they are: but not until we approached them with our concerns. Beaver Ridge Wind never did a sound study after the turbines went into operation. Their basic approach is to say nothing, do nothing and only respond when the Bloomsteins or other neighbors complain, but not until then. It has become evident to us that trying to be reasonable, open-minded and pro green has been rewarded by deceptive practices, small-town politics at its worst and a radically negative change to our lifestyle. We struggle to figure out what to do. We want the truth to be known. We want to be believed. We seek justice in the form of adequate compensation. We also hope in some small way we can prevent others from suffering a similar fate. Please don’t be so zealous in your support of alternative energy that you allow an industry, even a green one, to avoid any reasonable regulations. They need to be held accountable. No company out for profit should be given a free pass. My family and other families in similar situations should not be forced to seek compensation in the courts or make deals under conditions of confidentiality. Maine needs to grow up when it comes to wind development. There is no need to repeat the mistakes that were made in Freedom and Mars Hill.